We’ve just added a new page to the Birthday Party Ideas 4 Kids website – 35 Minute to Win It Games! Minute to Win It games are fun and challenging party games and are great for kids, tweens and teen parties. The games are easy to put together and only require items found around the house. If you have a few ping pong balls, straws, cotton balls and paper cups you can play at least half of the 35 games! Players can compete individually or as teams. We suggest if you have more then 6 people at your party to set up different stations and have several games going on simultaneously. Keep score or just let everyone play to have fun! Fun for girls and boys, kids, tweens and teens ages 6, 7, 8, 9, 10, 11, 12, 13, 14, 15, 16, 17, 18 years old! 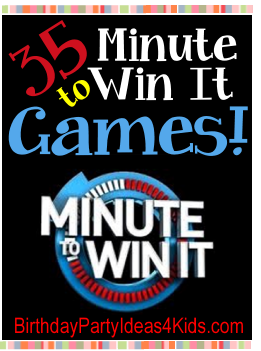 Minute to Win It Games – Choose your favorites and get the party started!! Use these games at your next Sleepover or Slumber party! See our Sleepover Guide for more fun ideas!